Two years ago, we published a list of the Top 10 Christmas Trees. Now here’s the sequel, to continue our Christmas celebrations. Many impressive trees have appeared over the last two years, and we also noticed some that deserved a spot on the last list. There’s just so many amazing Christmas trees, they may be another list in the future! We’ll start off with some humor before getting to the serious trees. Lady Gaga is well known for insane costumes, and no one could accuse her of not being the Christmas spirit when she attended the recent Jingle Bell Ball in London. 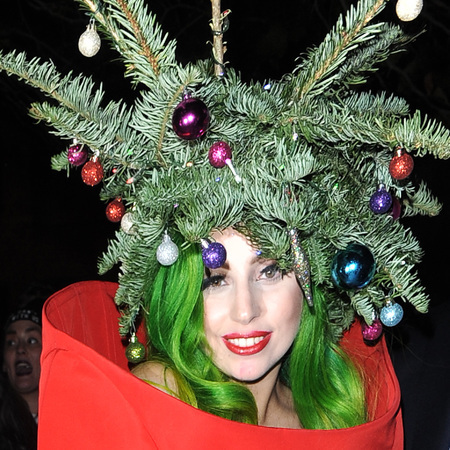 Instead of dressing up as a Christmas tree, Lady Gaga took it a step further – and wore one. A fully decorated tree was her hat, accompanied by green hair and a red dress. The media is usually harsh on her ridiculous outfits, but she was rightfully given a pass this time – nobody can be attacked for being too much into the Christmas spirit. 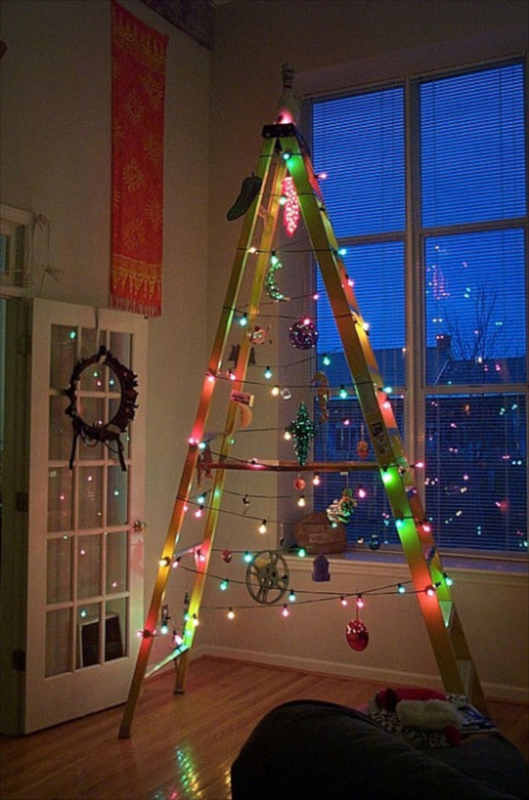 A recent trend taking off is ladder Christmas “trees”. For those a little lazy, and maybe not too fond of the Christmas season, you can open a stepladder and simply string some lights around it. But for the more ambitious, with enough decorations, and maybe even branches, it will be hard to tell there is a stepladder at all! I can’t say I’m too fond of this trend, I’m more of a traditionalist, but maybe those who like to experiment a little with their decorations will appreciate it. 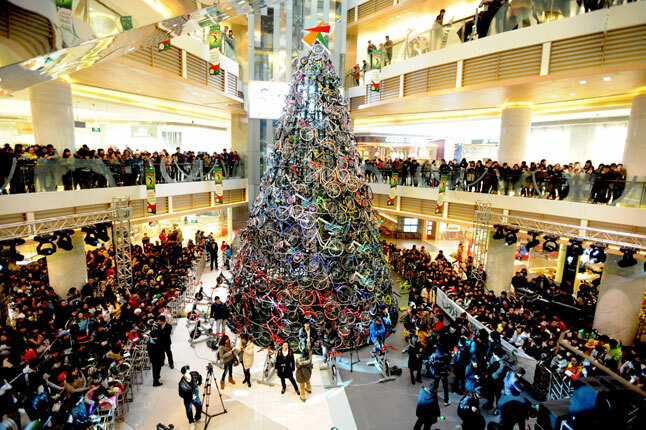 A shopping mall in Shenyang, China has an incredible 39-foot Christmas tree made up of 230 bicycles. Hundreds of people flocked to the mall to see the impressive tree. China is not a stranger to artificial trees, 80% of the world’s artificial trees are produced in the country. While it has been accused of “looking more like a pile of bicycles than a tree”, it is certainly impressive. 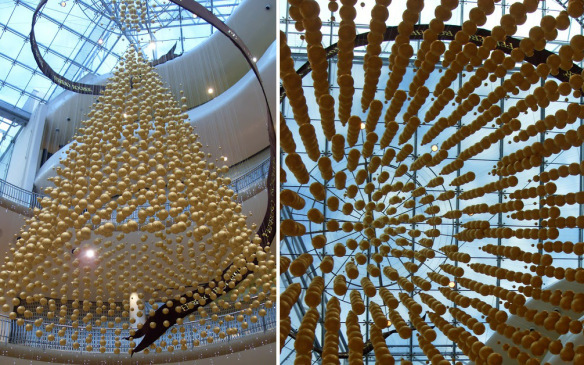 Italian chocolate company Ferrero SpA produced a beautiful hanging Christmas tree in a mall in Birmingham, England. Made out of Ferrero Rocher chocolates, the tree hangs from the ceiling of the mall. There are no supports, since each chocolate is hung individually, so when you stand underneath the tree and look up, it is incredible to view, it seems as if the chocolates will fall all around you. 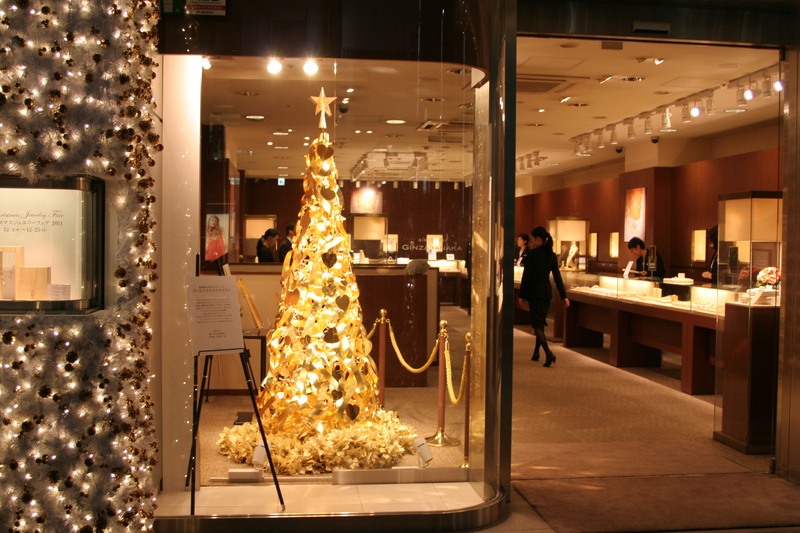 Last year, a jewelry shop in downtown Tokyo unveiled a pure gold revolving Christmas tree. The price? Only $4.2 million dollars. The 8-foot tree is made of 88 pounds of gold, which makes the price actually an excellent deal, according to the owner of the jewelry shop, Tomoko Ishibashi. The tree features silhouettes of 50 of the most popular Disney characters, and is finished off with ribbons – made of gold leaf, of course. 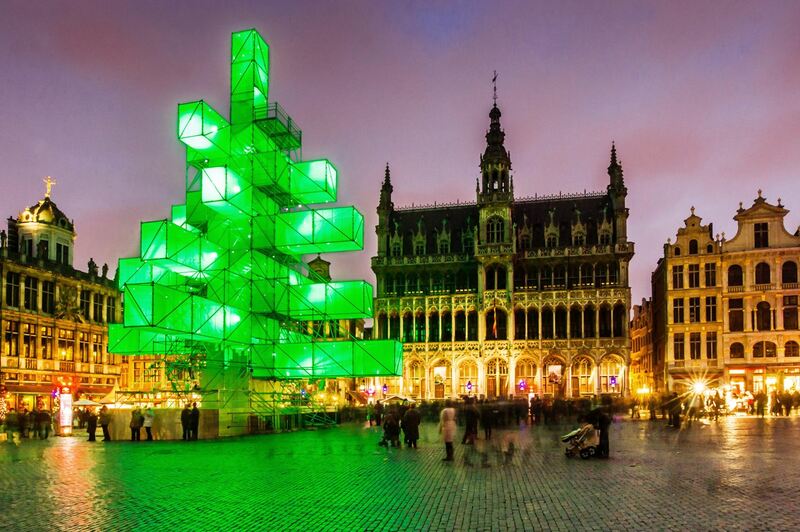 Perhaps the most controversial Christmas tree in recent years, the massive abstract electronic tree unveiled in Brussels last year was immensely unpopular. Protesters felt the “tree” was taking away from the spirit of Christmas and the design was chosen to avoid taking the risk of offending non-Christians. However, the mayor’s office was adamant that the design was only chosen because it kept with the year’s theme of “lights” and allowed visitors to climb to the top for an amazing view of the city. Legoland’s around the world have a tradition of “lighting” a Lego Christmas tree in December. Malayasia took it a step further by creating Asia’s tallest Lego tree. 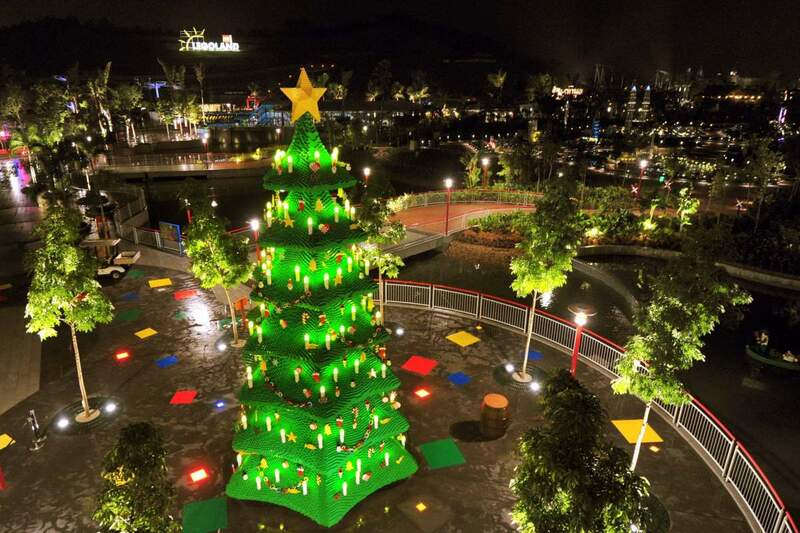 At 9 meters, the giant tree is made up of more than 400,000 lego blocks, and is “lit” by special LED candles strong enough to brave the Malaysian rains. 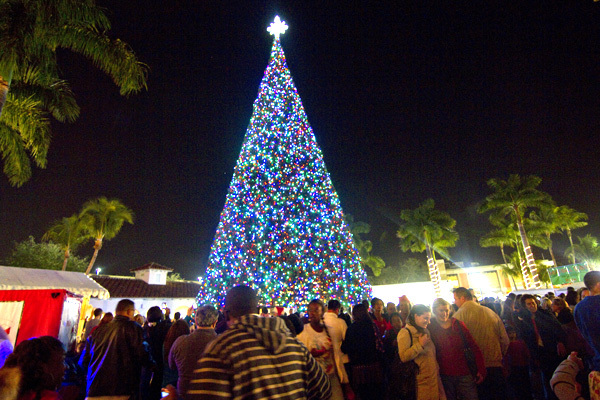 Every night, the tree will light up at 7 PM, to the delight of visitors to the theme park. While Malaysia may be a few meters behind London in the world rankings their Lego tree is still extremely impressive. 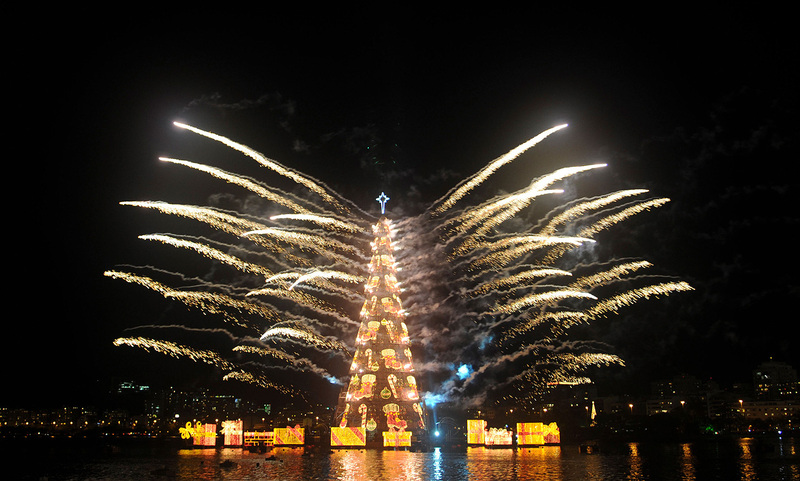 Rio de Janeiro’s floating Christmas tree has been recognized by Guinness World Records as the largest floating Christmas tree in the world. Almost 280 feet tall, the tree weighs 542 tons, and is built on 11 huge platforms. Until January 6th, the tree will feature a light show every night, with 3.3 million light bulbs synchronized to music, such as “The Nutcracker.” The tree will move to three different locations within in the city before its run is over. Already, thousands upon thousands have traveled to see the tree, despite Rio suffering from serious rainstorms recently. Named one of the best Christmas trees in the US last year, Delray Beach’s 100-foot Christmas tree has become a Floridian tradition since debuting in 1992. Starting the first week of November, “Mother Fluffers” build the tree by placing foliage on a giant metal frame, a process that takes the entire month. The star on top of the tree is 18-foot alone, and has nearly 40,000 ornaments. The tree opens on the lighting, December 5th, and stays open through January 1st. A tradition starting in 1933, the Christmas tree placed in Rockefeller Center, New York City attracts thousands and has become arguably the most famous tree in the world. The tree in carefully selected from around the world, and since 1986 has been a Norway Spruce. The record tree was 100 feet, the 1999 version. 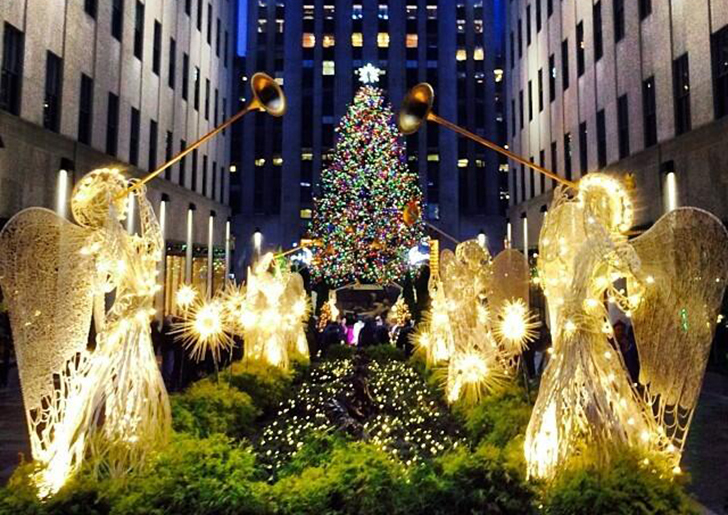 The lighting is broadcast on NBC every year, taking place on the first Wednesday after Thanksgiving. 2013’s date was December the 4th. After the tree is taken down, the lumber is given to Habitat for Humanity for charity.